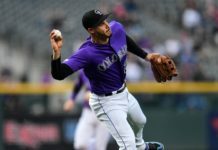 The Rockies finished the month of April with a losing record, but what would a winning record in April have meant anyway? It’s not as if we truly know on May 1 whether or not it will be a long summer awaiting the arrival of Broncos training camp. I’m not here to beat up the Rockies, though; the term “beat a dead horse” comes to mind. As I wrote when the season was starting, I have given up hating the Rockies and the way they do business down at 20th and Blake. I have decided, instead, to no longer fight that battle. In fact, I have made a 180-degree turn on the organization. Of course I still get frustrated by moves, or the lack thereof, made by the team throughout the offseason, and of course I would still love to see some competent management, but that’s a different story. Right now, Coors Field is the best bar in Denver, where all the cool kids go to post pictures to Snapchat and Instagram. So lets embrace it for what it is and accept that this is just the way baseball works here in Denver. So what did April teach us about the second best thing on 20th and Blake? What did we learn about the actual team in their first month? First and foremost, we learned that Trevor Story can flat out crush the baseball. Then we learned that when he’s not flat out crushing that baseball, he has a hard time getting any wood on it. But chicks dig the long ball, and no one remembers strikeouts in meaningless games, right? So for those about to mash! We salute you, young man. Lets not forget that Story is in his first year as a major leaguer and will only improve from where he is now. Besides, when the alternative is an overpaid, underperforming, aging shortstop that allegedly beat his wife, I’ll take the kid 100 times out of 100. Could Story flame out and be just another guy? Sure but I choose to enjoy the ride (So hard to not use a bad “Story” pun). We also learned the arguably the best pitcher in Coors Field history has lost his stuff. Jorge De La Rosa pitched just three innings during his latest outing against the Pittsburgh Pirates, and he gave up four runs in those three short innings. De La Rosa left the game after tweaking his left groin trying to run out a ground ball. He was placed on the disabled list the following day. 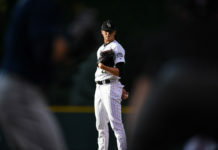 Jorge has a 4.64 career ERA and a 4.32 ERA in his nine years with the Colorado Rockies. This season, his ERA is 10.18! The new-found optimist in me is hopeful he can return to form when he is 100 percent healthy and mentally prepared to pitch again. The final thing I learned about this team is something that we already knew, but it was reiterated to all of us: Nolan Arenado is good at baseball — like, really good! As we know and see with Trevor Story, a big-time long-ball hitter usually comes with a cost, and that cost is strikeouts. That’s not the case with Arenado. In fact, in April he had 10 home runs and just eight strikeouts! He started May with a bang, too, going 2-4 in the series finale against the Diamondbacks, including a two-run bomb in the seventh. Obviously, there’s a lot of baseball to be played, but if he can continue to knock them out of the park more than he strikes out, he’ll join a very elite club. Since 1901 only 65 qualifying hitters have hit more home runs in a season than they had strikeouts. The last was Barry Bonds in 2004 and before that is George Brett back in 1980. I do not claim to be a baseball expert but I am pretty sure those guys are good! We’re only one mile into the marathon that is the Major League Baseball season, but if the team isn’t going to be a contender, then lets go watch Nolan chase a little history and have a little fun. Will he finish with more homeruns than strikeouts? Unlikely, but I will be at Coors all summer long rooting him on! Being optimistic is fun, why don’t we all give it a try?